For this week's Father's Day Challenge at The Kraft Journal, I made a very simple card to share with you all. 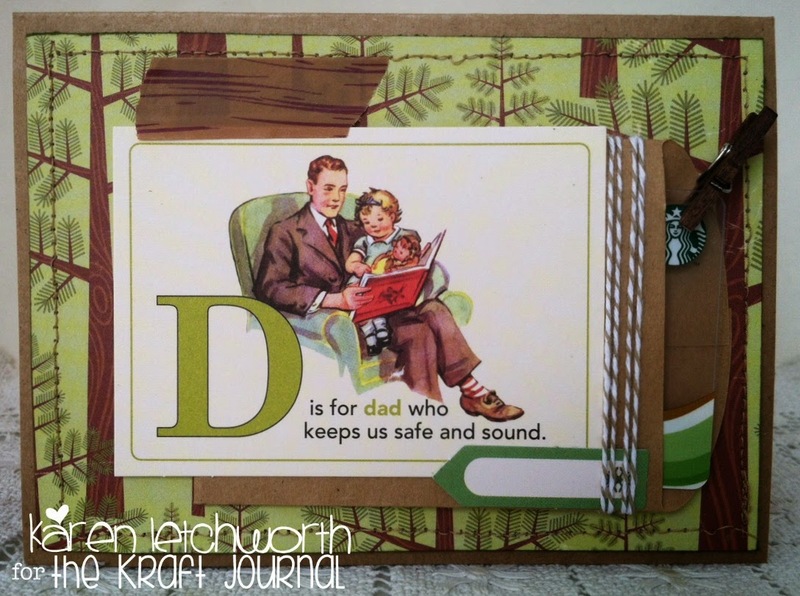 Since most of us need at least one Father's Day card, if not more, why not create something special for Dad and link it up in this week's challenge at The Kraft Journal? As long as you use some kraft or anything sold at the Kraft Outlet, you will be eligible for the $15 monthly prize. We really hope you will join us. I started my card by using a Small Lunch Bag Kraft Note Card as my base. To that, I added a piece of October Afternoon patterned paper that I machine stitched, and also included a sweet little October Afternoon journaling card to help celebrate Dad. 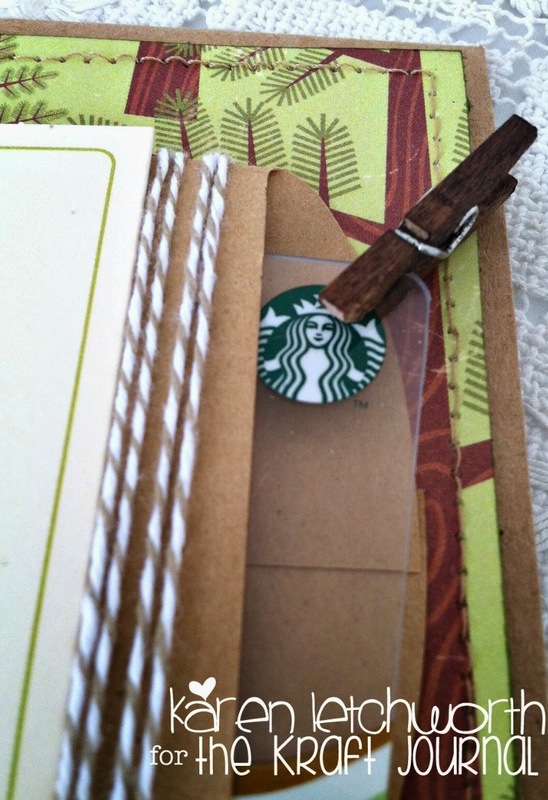 Since I knew that I wanted to include a gift card with this Father's Day card, I placed a Mini Kraft Merchandise Bag on the card that is wrapped with a long length of Green Baker's Twine. 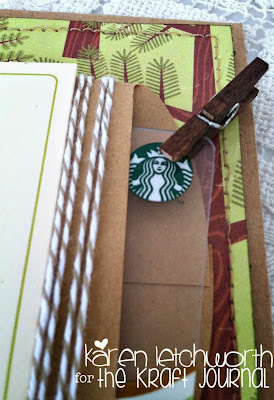 The Starbucks gift card is held in place with a sweet ink-stained Tiny Wooden Clothespin, and I also included a small piece of wood looking Decorative Washi Tape on my card. There are LOTS of great supplies at the Kraft Outlet to help you create something special for Dad. We would LOVE to have you play along with us this week. Like I said, you probably need to make at least one Father's Day card anyway, so why not link it up in our challenge for the chance to win $15 to the amazing Kraft Outlet. We can't wait to see your creations! Have a wonderful week, and thanks so much for visiting. Love this! I haven't played with anything vintage for a long time, this is perfect for Father's Day! Such a great fathers day card!! Sweet picture (I'm a boomer) , Wonderful colors I just Love it! Your art is just so Joyful!! It always inspires me!! Wonderful masculine card Karen - it will bless the recipient. I love everything about this card!! Love, Love, Love!! Thanks for joining the challenge @ HIMCR! I love that fathers day card just amazing you have the best embellishments ! !